After a seven-year hiatus, the Ministry of Antiquities will resume restoration work at Al-Zaher Baybars Mosque, including the pulpit. 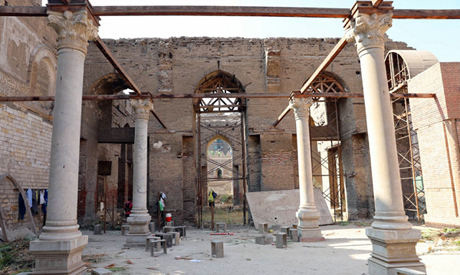 Mohamed Abdel Aziz, head of the Historic Cairo Rehabilitation Project, told Ahram Online that this is the first time to restore such a pulpit, parts of which were dismantled stored in the mosque’s storehouse. He explained that the projects department at the ministry will carry out the re-assembling of the dismantled parts and the restoration, and not the company in charge of the restoration of the mosque, as it was not included in the current project’s tender. Abdel Aziz explained that the mosque’s restoration originally started in 2007, but was halted in 2011 when the committee of the Supreme Council of Antiquities (SCA) supervising the work realised that the red bricks used in the restoration did not match the originals. “The Permanent Committee of Islamic Monuments had agreed to use adobe bricks in the restoration work that were similar to those originals and not mudbrick ones,” Abdel-Aziz told Ahram Online. He said that the restoration was funded by the Egyptian government and the government of Kazakhstan had also contributed $4.5 million. The overall budget is LE100 million. The first phase of the project was completed in 2008, when the mosque’s foundations were consolidated, putting an end to the leakage of subterranean water into the foundations by installing a new drainage system. The faulty electricity system was also replaced. The second and third phases had been started and includes the restoration of the minaret, the dome and the columns. “The second phase of the project will be more holistic in scope,” Abdel-Aziz said. The floor of the open courtyard will be paved with tiles similar to those used in the original design, while the four halls around the open court will be covered in a manner consistent with the mosque’s architectural style to protect the edifice from rain. A new lighting system will be also installed. The third and final phase will include the restoration of the decorative features inside and outside the mosque building.